it will enter your heart and capture your soul." As each year passes and he matures more beautifully each one, Henry and I see this cross is working beyond what we ever imagined. Sahran is a blend of two breeding programs that of course originated with many others (Ansata and Gleannloch & St. Clair and of course the EAO) before Kehilan and Silver Maple Farm began. Sahran's pedigree pictorially is incredibly impressive and filled with great horses, whether stallions or mares, the lineage is a powerfully potent one. He brings his own spectacular traits to the breeding barn; a beautifully rounded body, super hip, movement, legs and feet along with powerful movement and a huge flag like tail waving away. Peronsality wise he is very bold and unafraid but then, why should he be afraid as he has never known a day of unkindness in his life. Whenever he is displayed at the farm he enjoys cruising very closely next to the rail to make eye contact with whomever is watching. We look forward to training him under saddle and seeing just what he is capable of doing. 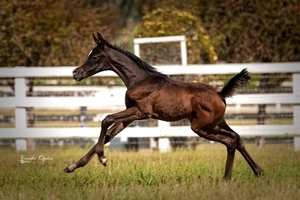 His first foal here in the USA was born June 25th to Danikah SMF (Ali Saroukh x Dance Diva by Raquin RA), a grey filly. His second foal is due now as well out of an Ansata Sinan Mare bred by Mitch Irwin and owned by A'ali Arabians of Bahrain. Well Nazeena foaled an exquisite colt, tall, very very stretchy with huge eyes and long, long legs. We wpormise photos soon! Sahran in Arabic means "awake" or possibly it is a derivative of the word Saharan as in the desert of that name. Sayo (Sigh-oh) is in honor of his maternal grandam, Glorietasayonaara that is twice in his pedigree (her nickname was Sayo). His dam Bint Bint Sayo is an inbred mare with only one line of the sixteen lines within the pedigree that is different. This is the Deenaa mare line and although this line is also a Dahmah Shahwaniah family, Deenaa came through a different branch of Futna of the Farida family tracing to El Dahma. 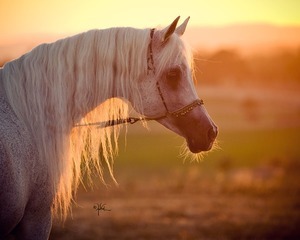 She was sired by the stallion Sameh and this relates to the sire side of Sahran's pedigree because Makhnificent KA traces to Sameh on his sires' line and again on the sire line of his dam. Most sire lines in the United States are heavily Nazeer bred, one of the four original sire lines imported to the US in the late 1960's and early 1970's. Because of this we thought that it might be interesting to use a stallion that would be an outcross to Bint Bint Sayo because she is heavily Nazeer bred on both the sire and dams' side. Makhnificent KA (Makhsous x Star Bint Hafiza by Ibn Dahman) was chosen not just because of his pedigree but because we thought he was a stallion with specific qualities that we wished to add to our program. Makhnificent KA is a champion at the Egyptian Event and a Top Ten 3 Year Old Futurity Halter stallion at the US Nationals as well. He brings a lot to the breeding equation in our opinion. Both maternal grandams in the pedigree are bay in color so we knew that also might be a possibility and when Sahran was born, low and behold from two greys came this gorgoeus bay colt. Henry and I think he has the best qualities of both parents. BB Sayo, the dam of Sahran is a rounded mare with elegance and refinement, her dam Samura is a rounder and heavier bodied mare than the usual Glorietasayonaara foals. They are quite tall and elegant with longer lines. We think this possibly came from the influence of Deenaa. She is from a wonderfully strong and potent mare line that is also a Dahmah Shahwaniah in family but from a different branch than the Glorietasayonaara side. This mare line also figures heavily in the best pedigrees of straight Egyptian horses in North America. Bint Bint Sayo is a combinaton of the lines, she is rounder than her grand dam but still elegant and a bit taller than her dam Samura, obviously more toward the phenotype of her grand dam. She has an extremely refined head, paper thin skin, chiseled tearbones tapering to a small muzzle. She has huge nostrils that are very fine on the outside edges and with no space between when they are open and very little when they are not inflated. Her neck is upright and her movement is strong yet, she is light on her feet. 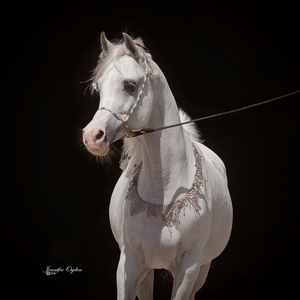 Phenotypically Sahran is masculine, there is no mistaking that he is a stallion. He has a rounded and more compact shape but he is not short by any means. His head is definitely from his dam and so is his personality. This family is loaded with character and really fun to be around. However, they can be a bit challenging because of their high spirits. When there is a presentation at the farm Sahran will literally cruise the crowd looking to see if he is being admired and he seems to enjoy that time very much. On a personal note, when he first attended the Egyptian Event in 2012 as a two year old he was stabled next to Sidon SMF. Everyday I would go and have time with each of them. Sidon likes his tongue rubbed as do all Saroukh sons! If they trust you and like you, then you may be offered their tongue to be rubbed...a very great honor I might add! Sahran saw me doing this for Sidon and the next day when I arrived to the stalls and started to walk by his stall he offered me his tongue!! It made me laugh out loud to think he was so clever. In 2016 Sahran is a being offered at the continued Junior stallion rate of $2000 to the first ten mares booked to him. Sayo Sahran SMF from Chrisite Metz on Vimeo.